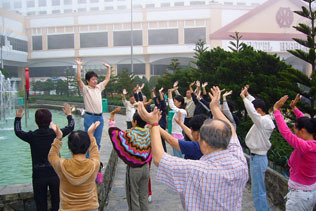 The course would introduce basic techniques of Zhineng Qigong. It also includes “Qi Pouring Body Strengthening Method” which is a combination of several methods in Zhineng Qigong. “Qi Pouring Body Strengthening Method” was introduced by famous Zhineng Qigong founder, Prof. Pang Ming in 1988. This method is simple and easy to learn. It is effective in preventing infectious diseases, enhancing immune system, disease curing as well as enhancing body and mind functioning. It is also very good for liver, kidney and spleen. Practicing the whole method only takes 10 minutes. It is short and effective. Hence, it is suitable for those who lead a hectic life but want to reduce stress and improve their body and mind by spending only a short time in qigong exercise every day. Beginners as well as those who have practiced qigong before are welcome!